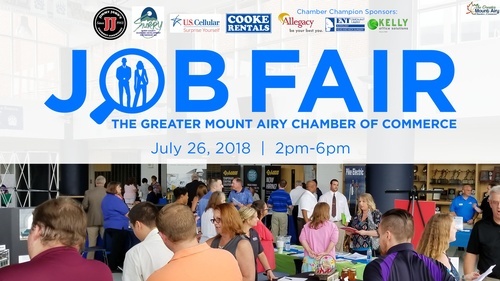 Anyone seeking employment is invited to attend the Job Fair hosted by The Greater Mount Airy Chamber of Commerce. This is an important opportunity for you to share your resume, meet with hiring businesses in the community, share your experience and skills, and possibly land a great job! If you are planning to attend as a job seeker and would like to submit your resume, please email it to Randy Collins, Chamber President & CEO, via randy@mtairyncchamber.org. NCWorks Career Center will be attending the Job Fair to assist job seekers in creating or updating resumes. They will also be providing career counseling and offer tips to making a lasting impression on employers. Free internet access will be available and resumes can be formulated and printed on location. Limited space is available to sponsors and vendors. Seeking companies who have positions to fill. Vendor space also open to firms who offer services to job seekers. Vendor set up 12pm-1:30pm, Doors open at 2pm. Event will be promoted throughout the region, from Galax to Winston. 2017 event had 40 vendors and 150 job seekers. Includes 8’ table, logo on marketing material, premier vendor location, private interview space, electric, access to all resumes rec’d and 3 vendor lunch tickets. 8’ table, premier vendor location, access to all resumes rec’d 3 vendor lunch tickets. Contact Travis Frye at the Chamber via email, travis@mtairyncchamber.org or click Register above to reserve your space and pay online. FREE ENTRY to all Job Seekers. Submit resume to randy@mtairyncchamber.org. Click Register button to the left to register your business.